This de Broglie wavelength calculator will help you describe the wave-particle duality of matter. According to this principle, we can analyze light as waves, explaining its properties such as refraction. On the other hand, light must be made out of particles (called photons) if we want to understand the photoelectric effect. De Broglie stated that every particle can be described as having a certain wavelength and formulated the famous de Broglie equation. If you want to know, what is de Broglie wavelength of an electron or a photon, just keep reading! h is the Planck constant, equal to 6.6261 * 10^(-34) Js. The mass of particles is rarely expressed in grams or kilograms - it would be impractical, as the mass of electrons or even atoms is manifold smaller. The units most often used are me (electron rest mass) or u (atomic mass unit). You can use these units it our de Broglie wavelength calculator. Let's find the de Broglie wavelength of an electron traveling at the speed of light. The mass of an electron is equal to 1 me, or 9.10938356 * 10^(-31) kg. The speed of this electron is equal to 1 c, or 299 792 458 m/s. Multiplying the mass and speed, we obtain the momentum of the particle: p = m*v = 2.7309245 * 10^(-22) kg*m/s. If we divide the Planck constant by the momentum, we will obtain the de Broglie wavelength: h/p = 6.6261 * 10^(-34) / [2.7309245 * 10^(-22)] = 2.426 * 10^(-12) m.
Choosing proper units, we can say that the de Broglie wavelength of this electron is equal to 0.0024 nm. 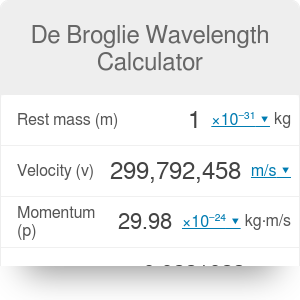 De Broglie Wavelength Calculator can be embedded on your website to enrich the content you wrote and make it easier for your visitors to understand your message.